Before you proceed, please have a quick study on How to take a Free Trial Lesson at EIGORU-en. For complete details, please click this Free Trial Lesson Procedures. ✻ We use Philippine Time (UTC/GMT +08:00) Please make sure to match it to your country time zone. ✻ You, Student, must have any of the following Payment Processor to pay for your Lesson Fee. *Our payment system is a Postpaid one (pay after 4-week lesson contract), therefore please make sure that you can pay your teacher's lesson through having any of the Payment Processor above.. Thank you for the full cooperation in advance. Your contract will be dismissed immediately if you are found guilty of immorality and/or misconduct with appropriate penalty charge. * Trial Lesson Order(Japanese language). * Trial Lesson Order(English language). * Emergency reply request. This is 2nd request. * No reply after the 2nd request. * I want to Cancel my Trial Lesson. * I want to Cancel my Trial Lesson because there’s no reply from you. Note: After you submit your application, you will receive an email regarding a copy of your submitted data to the email you input in "Student’s Email", as shown above.✻ If you do not receive it, there is a possibility that the entered address is incorrect. Please re-enter and re-submit. Thank you. We will use this when your main email is malfunctioning. Please enter the nickname you want your teacher to call you. This is highly confidential and not disclosed with the teachers. We need this information to verify your identity and to secure that you can pay our teacher's lesson fee. If you cannot find your available payment processor, then please immediately email us at eigoru.office@gmail.com. 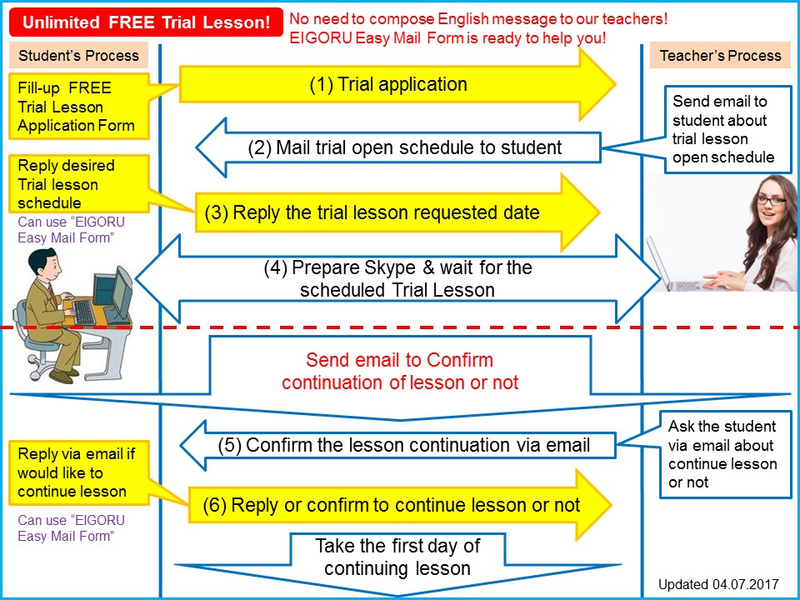 IF EVER you hope to continue lessons with your trial teacher then kindly mail your teacher if you want to give more details regarding your hope regular lesson schedule. ● Hope TIME of Regular Lessons (if ever you decided to continue lessons with the teacher) Philippine Time (UTC/GMT +08:00) Please make sure to match it to your country time zone. 1 lesson (25 minutes) 2 lessons (50 minutes) 3 lessons (75 minutes) 4 lessons (100 minutes) More than 100 minutes Kindly mail your teacher if you want to give more details regarding your hope regular lesson schedule. ✻ If you hope to use your own lesson material such as e-book, article, etc., then please send it thru email at least 24 hours prior to lesson schedule so that the teacher has enough time to prepare for it. ✻ You can take pictures for each page of your e-book and send/attach them to your teacher thru email. But please, make sure that each page you took a picture is clear and readable. Thank you! Your teacher needs the following fields in preparing your lesson. e.g. 5 ✻It is a good hint for the teacher’s lesson preparation. -I’ve experienced taking online lessons. -I have no experience of taking any online lesson. -Other It is a field for confirming the student’s level of English beforehand, so that the teacher can estimate which lesson is suitable for the student. -I have experienced learning English in EIGORU. -I have no experience of learning English in EIGORU. -Other It is a field for confirming the student’s level of English beforehand, so that the teacher can estimate which lesson is suitable for the student. 1. Excel Lesson Sheet (default) 2. Photo Lesson Sheet 3. Both if needed Please select which TYPE of the Lesson Sheet you hope your teacher to send you. Lesson Sheet is an excel file which will contain all your lesson history and will be created/updated by your chosen teacher. You have to decide which type of Lesson Sheet you hope to be sent by your teacher. ✻ If all possible, please do not select #3 because it would give heavy load to the teacher. ✻ You can change it at any time you need, so pelase ask the teacher beforehand. The following field will be used only by EIGORU management. We will not inform this to the teacher. Although we are sorry to trouble you, but please fill-in your true and complete detail because this is for Postpaid payment system. Thank you. Review your answers above and kindly check the box below to confirm that all information you'll submit is true. Thank you. Yes, I will submit this data. Review your answers before you click the Submit button below. ✻ The Confirmation Screen is not displayed on this form. Please confirm that there is no mistake in your answers or information above. Please understand that it is a specification not to display the confirmation screen to keep original input contents. When you click the "Submit" button below, you might see the message "There are errors on the form. Please fix them before continuing. ", it means that you forgot to answer some required fields, by then, please find and answer them. After clicking the "Submit" button below, please wait for the "Thank You" page to confirm your submission. Thank you!